An IMU calibration resets the gyroscope and accelerometer data to tell the aircraft when it’s perfectly level and not moving. I only do an IMU calibration after a firmware update or if I’ve travelled to another country and the drone could have suffered knocks or large atmospheric changes. In order to get a good IMU calibration the drone should not be hot, so it should never be done after the drone has been running. The aircraft should have been switched off for at least ten minutes and ideally be in a cool location such as an air-conditioned room or in a cool climate. The drone should be placed somewhere stable and ideally a spirit level placed across from motor to motor to check for perfect level. Each foot can be adjusted by placing pieces of paper underneath until perfect level is achieved. Once level the IMU calibration should be started as soon as possible after switching on the drone and then there should be no movement of the drone during the calibration process. Once complete the IMU calibration should be good until the next firmware update or the airframe is exposed to large forces. So with points 1 & 2 in mind you shouldn’t need to calibrate anything prior to each flight, however it is very important to check what the sensors are reading and understand if you do need to take action. 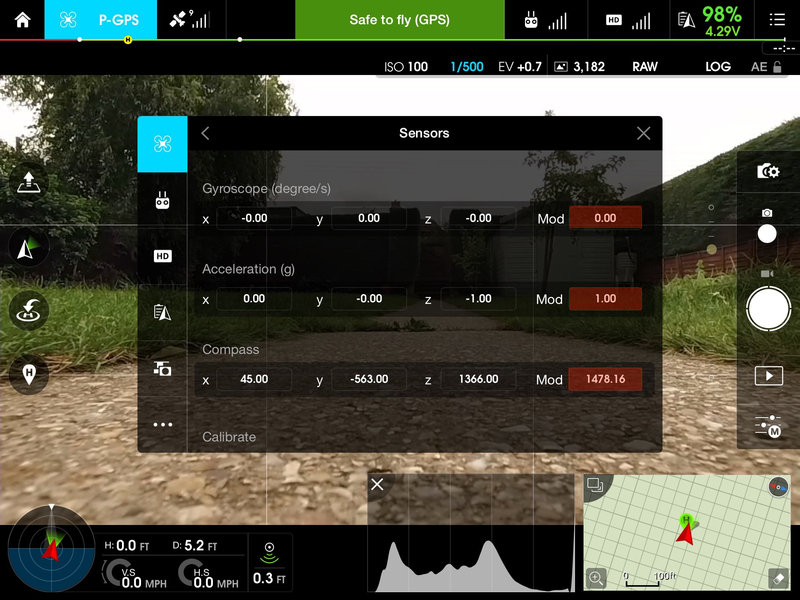 With the drone powered up and the DJI app running you can navigate to the MC Settings page and then scroll down and select the Sensors view that should look like the image below. I’ve highlighted the values you need to pay attention to in red. The compass data is the lower of these three Mod values. This number will always be changing but I like it to stay between 1400 & 1599. One good test is to leave this page open and then carry your drone around and watch how different objects affect this value. If you’re indoors then you’ll see huge changes near power cables and pipework or if outdoors try placing the drone in various places on pavements and you’ll likely see big changes as hidden pipes or buried power cables have an effect. If you see out of range numbers in a location where you need to fly then try moving the drone to a different take off area to see if the reading is better. If you still can’t achieve normal readings then try holding the drone at head height, you may find that if there’s something underground affecting the readings the results could be better once clear of them. That’s why it’s important not to calibrate blindly, you need to understand what’s happening with the sensors and make the call when to calibrate accordingly. If I’m in a location that’s giving out of range readings on the ground I’ll generally trust the compass calibration I’ve already got locked in and take off and land using P-ATTI mode so as the ground interference doesn’t affect the system. Obviously if the readings are out wildly then it’s probably not going to be safe to fly at all. There’s no real fool proof process, but it’s better to have an understanding of what your drone is sensing than to just calibrate it to its surroundings regardless of whether those surroundings will remain the same once you’ve taken off. The other readings highlighted show the Mod values for the Gyroscope and Accelerometer. In my experience once an IMU calibration is complete these are very rarely out and only vary by 0.1 values. Obviously if you see bigger differences and the drone is not moving then don’t fly as the IMU is not calibrated correctly. It’s important to land with power in reserve because if something were to happen that requires you to delay the landing you need enough time to either find a new landing spot or deal with the problem. The other important factor to bear in mind is that when the battery hits 10% a DJI Inspire 1 or Phantom 3 will automatically initiate it’s “Smart Go-Home” feature and head for its home point. While heading home at 10% may seem like a useful safety feature it can also be disastrous! Let’s say for instance you’re coming in to land and decide to bring your drone down in the field adjacent to the one where you took off. Everything could be going to plan but if the battery were to hit 10% the drone would automatically change direction and head for its home point giving you little time to respond. If there are any trees or other obstacles between the drone and its takeoff point it will fly straight in to them. 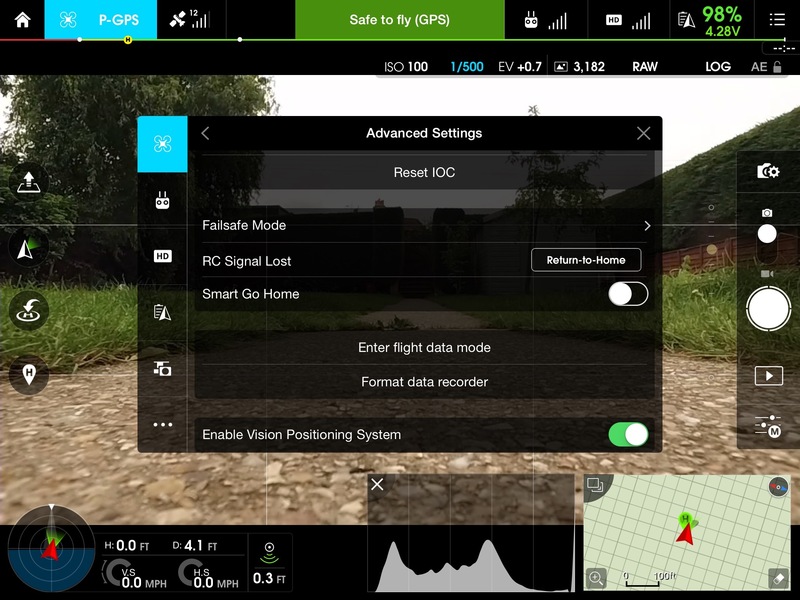 Recently DJI have added an option to disable Smart Go-Home which can be seen in the image below. By disabling this option the drone will simply initiate a landing at its current location rather than head home once it reaches 10% power. As always though you need to make the call with each flight, as there could be times when it’s better to leave Smart Go-Home enabled. The Go app also monitors the power required to get the aircraft back to the home point and will initiate a return to home automatically if Smart Go-Home is enabled. If the drone loses signal from the controller or the pilot initiates the Return To Home feature it will climb to a predetermined altitude before heading to the home point. You should always check the area you’re flying in and make a best guess as to what would be the safest altitude for the drone to return at without hitting an obstacle. The temptation is to set the maximum allowed height but you may be in a situation where battery power is low or flying to that altitude could present other dangers to your drone or to other air users. It’s better to set an altitude that puts you well clear of any obstacles without having to fly to max altitude. It’s also important to check that the correct home point has been set for each flight. When the motors start there should be an audio alert saying “The home point has been updated, please check it on the map“, it’s worth doing that just to make sure the home point is where it should be. Any devices that transmit can have an effect on the communication between your drone and the remote controller. Most DJI systems use 2.4 Ghz as a control frequency, which is the same frequency used for domestic WiFi. While the two can exist side by side you will find that interference can occur and control distances decrease so where possible always switch mobile devices and especially tablets used on the remote in to an Airplane safe mode which disables all output from the device including bluetooth and telephone communication. One downside to switching the controller tablet to Airplane mode is that the live map view will no longer load content. You can however pre-load map data by prior to entering airplane mode by pressing on the map and then scrolling around the area that you will be flying in. The map data should remain visible once airplane mode is enabled. If the map data is not cached then check ‘Cache Map in the Background’ is enabled in General Settings in the Go App. The two main flight modes on a DJI drone are P-GPS and ATTI ( attitude mode). Using GPS to stabilise a drone is extremely useful, the drone stops and holds position where it’s told to and even helps you to fly in the right direction in windy conditions. We’re also seeing advanced GPS modes used such as follow me, orbit modes and waypoint steering, and these are all very useful but the thing to remember is that any time you’re using a GPS mode the drone is essentially flying itself. You might be telling the system where you want it to go, but it’s making the decisions about how to get there itself. Occasionally things can and do go wrong! Many people make the mistake of thinking they are in full control when flying in P-GPS mode and then get frustrated when something goes wrong and the drone becomes uncontrollable. Rather than trying to fight the failing GPS system what you need to do in that situation is take control using ATTI mode. The first thing to note is that by default DJI doesn’t allow access to ATTI mode on the controller. Yes there’s a nice little switched marked P and A but moving the switch to A will not engage ATTI mode unless you first enable it in the DJI Go app. In the image above note the option called “Multiple Flight Mode”. With Multiple Flight Mode enabled you can now switch to ATTI mode using the mode switch on the controller. Flying in ATTI is not that different from flying in GPS mode: the drone will still maintain its altitude and the controls still function the same. The main difference is that the drone will no longer hold position automatically, it will be affected by any wind as well as its own inertia. I always think of ATTI mode as being like a pebble on a frozen pond: if you give it a push in one direction it will keep going, so in order to stop it you need to push it back in the opposite direction. Practise flying ATTI in the DJI simulator and then try it in an open field where you have room to make mistakes. It shouldn’t take long to get to grips with it and then you’ll have the ability to take control if GPS fails or the GPS control system isn’t functioning correctly. I always look at P-GPS as a feature to use occasionally now and fly in ATTI most of the time. I always take off in P-ATTI mode as well as the worst time to discover a GPS fault is upon takeoff when you have little time to adjust to the situation. Obviously this requires careful operation if it’s windy so take care trying it and be aware of the wind direction and speed before taking off. 8. Check props, and check again! I see so many reports of people crashing their drones due to a prop “flying off”. While I’m sure a prop can wear and / or break I expect that most of the time it’s down to a prop not being securely fitted in the first place. We humans tend to make mistakes and when doing something repetitive like fitting props it’s very easy to overlook something. If using self-tightening props always wind them on and then hold the motor for the final tighten. With the Inspire you can also fit prop locks to further reduce the risk of a prop working loose. If using DJI’s new quick release props on the Inspire 1 or Matrice then it’s important to ensure that each prop has popped up into its locked in position. Watch the base of the prop and as you push down twist it; that way you can confirm it visibly raises on the springs as it enters its locked position. With the quick release props you should confirm correct fitment by holding the motor and attempt tuning the prop in both directions to check it’s locked in. Later during my pre-flight routine I always check the props again, it may seem a drag but a lost prop on a quad will result in a crash, it’s better to be sure that are fitted than to lose that expensive drone. iPad: App running, map cached, Airplane mode, Volume Up. Landing Gear: Raise Gear and fly! If you can see your drone then the chances are the remote control can also communicate with it. Distance can have an effect on radio communication and the laws vary from country to country on how far you can fly a drone. Here in the UK we are limited to flying within line of sight (defined as 500m from the pilot). It’s not all about distance though! Lets say you’re filming a large circular water tower that’s only 30m away and you’re thinking about grabbing a nice orbit shot around it. Even though the drone may only be 40m from you as it passes around the back of the tower there’s a good chance control will be lost as the radio signal cannot transmit through the tower. At that point the drone would switch to failsafe mode, climb to the preset altitude and then fly back to home point. If you’d set the failsafe altitude higher than the tower and there were not other obstacles in the way you might be fine. If the failsafe altitude was lower than the height of the tower then it would be goodbye drone! Try and keep the drone in sight at all times. Okay I know that’s more than 10, this one is a bonus! The Phantom 3 models as well as the Inspire 1 both include VPS (Vision Positioning System) modules that help maintain position and height at low altitude. Most of the time the VPS will help you but there are times when having it enabled could cause you problems. If you’re flying indoors or in an exterior location with objects above the drone you might want to disable the VPS to stop the drone from maintaining its height automatically. If for instance the drone is flying over objects on the ground then having the VPS enabled will result in the drone adjusting its height as it passes over each object and possibly colliding with the ceiling or obstacles above it. DJI responded to such comments saying that the intelligent batteries need to be fully charged at the start of each flight “as per the manual” in order for their usage monitoring to give reliable results. While you’ll probably get away with using a semi-charged battery most of the time, this could happen so be aware, and don’t fly too far from a safe landing spot. Older PostWhy you MUST have 4K and raw and why you absolutely DON’T need it!